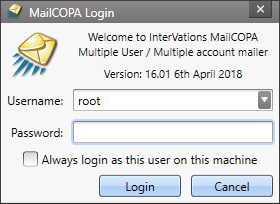 The first thing you must do when running MailCOPA is log into the system (unless you are set up for immediate login). Select the Username you require in the drop-down box and enter the appropriate password. If no password has been set you can just press the Login button. You can log onto the system as another user at any time from the main menu by selecting the File Logout menu option. This will close your current MailCOPA session and re-display the MailCOPA Login dialog box. Once logged in, it is possible to have MailCOPA automatically login as a specified user, (Configuration Preferences Global), or you can use the checkbox on the Login dialog to achieve the same end - see graphic below. Alternatively an immediate login can be set up in the MailCOPA shortcut, see here for details.